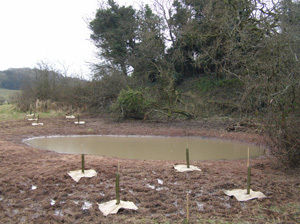 February 2013 saw the launch of the Wenvoe Jubilee Wood. This is situated behind and to the west of Mary Immaculate School on Caerau Lane. 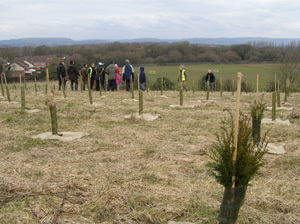 More than 6,000 trees have been planted with 19 varieties including yew, hawthorn, oak, field maple and aspen. 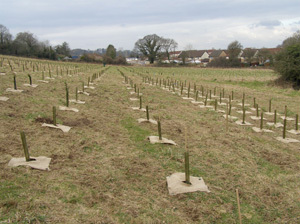 The Jubilee Woods project led by the Woodland Trust aims to plant 6 million trees and as of March just over 5 million had been planted. Woods bring many benefits to both us and wildlife, storing carbon, stabilising the soil and generating oxygen. The UK is now one of the least wooded places in Europe with only 12% of our countryside wooded compared with an average 44% in Europe. And of the woodland we have only 40% is native, most of the rest commercial conifer plantations. 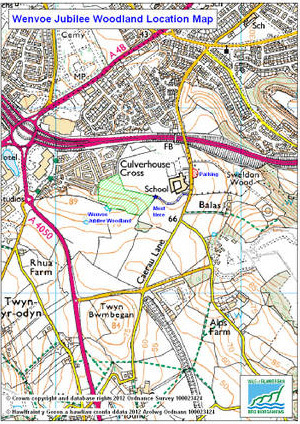 If visiting the Jubilee Wood you can either park opposite the school and then follow the waymarked track to the left of the school or, if on foot, it is probably safest to walk towards the Alps Quarry and then take the lane to the left which comes out on Caerau Lane a short way from the entrance to the wood. Caerau Lane itself is a bit of a rat-run for cars and best-avoided on foot.